China this week carried out another test of a new high-tech hypersonic glide vehicle, an ultra high-speed missile designed to deliver nuclear weapons and avoid defenses. The latest test of what the Pentagon calls the Wu-14 hypersonic glide vehicle was carried out from the Wuzhai missile test range in central China. The test was judged successful, according to defense officials familiar with details of the event. Additionally, officials said the glide vehicle, which travels along the edge of the earth’s atmosphere, demonstrated a new capability: evasive actions. U.S. intelligence agencies have been tracking the Wu-14 since for over a year and have gained valuable insights into the weapon, the officials said. No additional details were provided on the maneuvering activities of the Wu-14. However, the evasive actions bolstered suspicions that China is building the missile with capabilities designed to defeat U.S. defenses. Current U.S. defenses are designed to track missiles that travel in predictable flight paths and are unable to counter maneuvering warheads and glide vehicles. The latest Wu-14 test took place Wednesday. It was the fifth test of the glide vehicle and the second since June. The weapon is launched as the last stage of a missile that reaches speeds of around Mach 10, or 10 times the speed of sound—around 7,680 miles per hour. Military analysts said the Chinese test schedule indicates that China may be close to deploying the high priority weapon. Earlier flight tests took place this year on June 7 and last year on Jan. 9, Aug. 7 and Dec. 2. The weapon system and tests were first reported by the Free Beacon. Asked about the test, Pentagon spokesman Cmdr. Bill Urban said: "We do not comment on PRC weapons tests but we do monitor Chinese military modernization carefully." A defense official, however, said the Wu-14 is viewed as a serious emerging strategic threat that could complicate U.S. nuclear deterrent efforts. "At a minimum this latest test indicates China is likely succeeding in achieving a key design objective: building a warhead capable of withstanding the very high stress of hypersonic maneuvering," said Rick Fisher, a China military expert. "It is likely that the test vehicle will form the basis for a missile launched weapon." "The advent of a Chinese hypersonic weapon may pose the greatest early threat to large U.S. Navy ships," said Fisher, a senior fellow with the International Assessment and Strategy Center. "The best prospect for a defensive response would be to greatly accelerate railgun development." Lora Saalman, an expert on hypersonic technology and former research associate at Carnegie-Tsinghua in Beijing, said the two most recent Wu-14 flights coming within two months are "unprecedented in terms of pace and frequency," and suggest "a form of qualitative arms racing vis-a-vis the United States." "If the intent is for the Wu-14 to be a longer-range system for delivering conventional payloads, then it is likely an effort to extend the range and flexibility of China's [anti-access, area denial] capabilities beyond that of the DF-21D missile," she said. "If this conventional system is mounted to reach an intercontinental range, then it could represent an effort to catch up with or even beat the United States to the punch on its own Conventional Prompt Global Strike aspirations," Saalman added. A nuclear-armed Wu-14 is likely intended to defeat U.S. missile defenses, Saalman said. "The difficulty is that each of these eventualities and aims are not necessarily mutually independent, nor are they distinguishable without more technical details on the most recent test," she said. 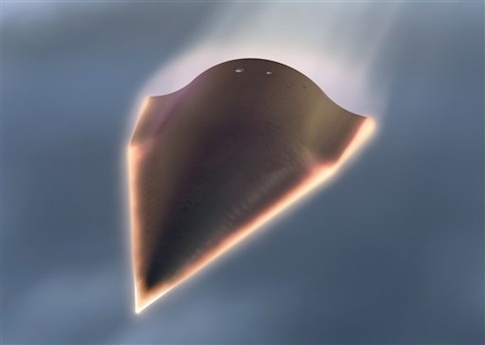 Adm. Cecil Haney, commander of the U.S. Strategic Command, warned in a speech last month that hypersonic glide vehicles are new technology weapons that pose an emerging threat. The command is in charge of nuclear forces and missile defenses. Asked to elaborate on the hypersonic threat, Haney said: "As I look at that threat, clearly the mobility, the flight profile, those kinds of things are things we have to keep in mind and be able to address across that full kill chain," Haney said. The kill chain is the military term for the process used in targeting and attacking enemy missiles. Outgoing Strategic Command Deputy Commander Air Force Lt. Gen. James Kowalski, said hypersonic weapon technology "certainly offers a number of advantages to a state,"
"It offers a number of different ways to overcome defenses, whether those are conventional, or if someone would decide to use a nuclear warhead, I think gives it an even more complicated dimension," Kowalski said during the same conference in Omaha. Kowalski said so far no hypersonic weapons have been fielded by the Chinese or Russians but "it remains something that concerns us and may be an area of discussion in the future." A congressional Chinese commission stated in its annual report last year that China’s hypersonic missile "could render existing U.S. missile defense systems less effective and potentially obsolete." China, Russia, and the United States appear engaged in a quiet hypersonic arms race. Russia tested a hypersonic missile in February. The Pentagon also is conducting research and development on hypersonic arms, including an Army missile and a glide vehicle and a scramjet-powered hypersonic weapon. The current version of the House defense authorization bill contains funding and language aimed at pressing the Pentagon to counter hypersonic threats. One provision calls for adding $291 million for development of a long-range variant of the Army Terminal High Altitude Area Defense, or THAAD. Bryan Clark and Mark Gunzinger of the Center for Strategic and Budgetary Assessments estimate that the United States and Russia are "very close" to having hypersonic arms. China’s glide vehicle appears to be part of anti-access, area denial strategies. "While ‘boost-glide’ weapons will have long ranges and be highly survivable, but they will also be very expensive," they told the National Interest. "China could use them as a ‘silver bullet’ weapon to hit high-value targets, or do so in conjunction with less-expensive weapons that reduce the defender’s capacity first." Clark and Gunzinger also say that China could use air-launched hypersonic weapons to attack U.S. and allied bases protected by missile defenses. "U.S. forces will have to think about how they will use point defenses to protect high-value targets," they stated. "It is very difficult to defend against hypersonic weapons using our traditional ‘layered’ approach," said Clark and Gunzinger. "Since they are going very fast, it will be hard for area air-defense interceptors such as the Navy SM-6 or Army PAC-2 / PAC-3 to catch them unless they are launched from the target’s location." "The best defenses against them will likely be high-capacity point defenses such as Rolling Airframe Missile, CIWS and possibly rail guns that are co-located with a target." This entry was posted in National Security and tagged China, Weapons. Bookmark the permalink.